Macclesfield Forest is a excellent place for outdoor activities including horse riding, walking, cycling, fishing and bird watching including the Peak District's largest heronry at Trentabank Reservoir. 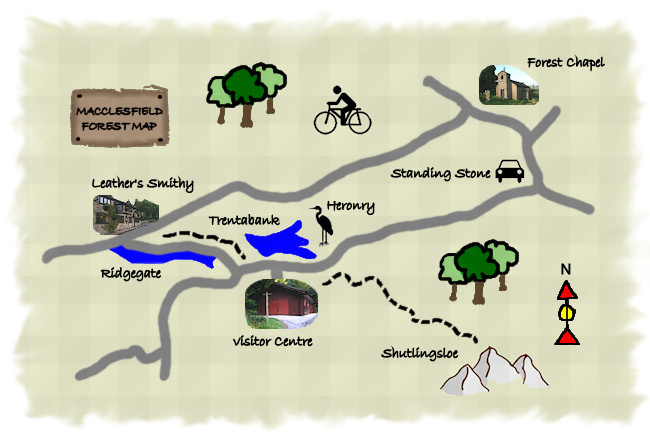 A few walk descriptions with maps are linked to below, they can be combined with longer routes including Wildboarclough Village and the Goyt Valley and towards Teggs Nose and the popular Gritstone Trail. The heronry at Trentabank is a popular bird watching destination with a viewpoint and information board in the lay-by near to the Visitor Centre. Many other wildfowl can be spotted in the forest including grebes, coots and ducks. Fly fishing is available at Ridgegate Reservoir where the Macclesfield and District Fly Fishing Club have fishing rights and there are limited number of day tickets available. Trentabank Reservoir has no fishing as it is a nature conservation area.